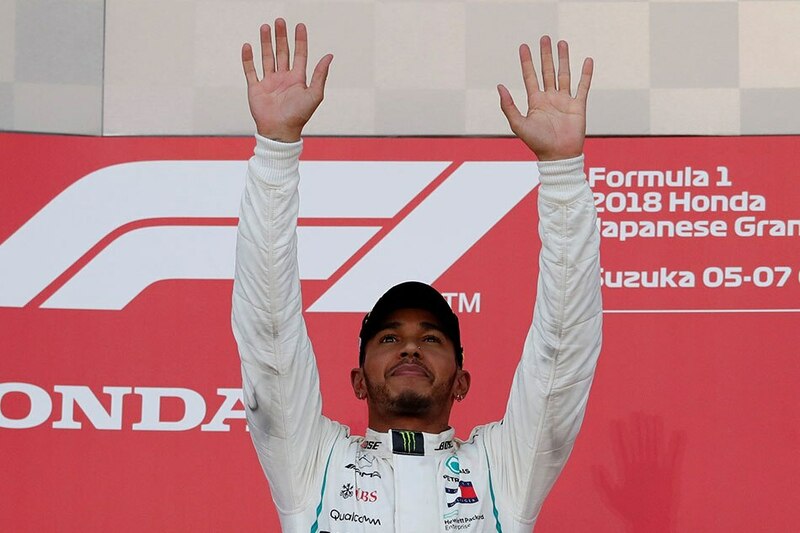 SUZUKA, Japan — Lewis Hamilton won the Japanese Grand Prix to stand on the brink of a fifth Formula One title on Sunday while Ferrari rival Sebastian Vettel finished sixth after colliding with Max Verstappen. Hamilton led from pole to flag, crossing the line 12.9 seconds ahead of teammate Valtteri Bottas in a second successive Mercedes one-two. Verstappen finished third. The Briton now has a 67-point lead over Vettel with four races remaining and can sew up the championship next week with victory in Austin should the German finish lower than second. Hamilton will fancy his chances of doing just that given his record at the U.S. Grand Prix, where he has won every race but one since 2012. "We've gone from strength to strength as a team this year. Austin is generally a good track for us and I can't wait to unleash this beast there," said Hamilton after leading every lap at Suzuka for his 71st career win. He is now only 20 victories off Michael Schumacher's all-time record. "I hope you guys are not getting bored of this, because I'm definitely not," added Hamilton, who has now won six of the last seven races and four in a row. "I loved it." Vettel, who had started eighth after a failed tyre gamble in qualifying, made contact with Verstappen’s Red Bull and spun while trying to pass the young Dutch driver for third on the eighth lap. The German resumed in 19th and scythed his way back through the field, setting the fastest lap of the race in the process. Stewards reviewed the Verstappen contact and took no action. "If I don't go for that gap and that gap was there, I might as well go home. Sorry for the result," said Vettel. Ferrari boss Maurizio Arrivabene said the podium had been within the team's grasp. "I know the situation looks impossible but our job is to challenge the impossible, this is what we are going to do in the next four races," the Italian told Sky Sports television. Verstappen pushed the other Ferrari of Kimi Raikkonen off the track in an eventful race. He was penalized five seconds and could well have finished second without it, having crossed the line 1.3 seconds behind Bottas. "The touch with Sebastian … in that corner you can't overtake. I even gave him space but he understeered into my car," said Verstappen. Australian Daniel Ricciardo, who started 15th after an engine failure in qualifying, finished fourth for Red Bull and ahead of Raikkonen after making the jump during the pitstops. Mexican Sergio Perez took best of the rest honors for Force India in seventh, while Romain Grosjean was eighth for Haas. Esteban Ocon completed a double points finish for Force India in ninth while Carlos Sainz took the final point for Renault. Honda-powered Toro Rosso were unable to convert their impressive qualifying in the manufacturer’s home race into points. Frenchman Pierre Gasly, who started seventh on the grid, finished 11th after losing out to Sainz two laps from the end while New Zealander Brendon Hartley, who lined up sixth, fell to 13th at the finish. The safety car was deployed early on after Kevin Magnussen's Haas suffered a puncture, scattering debris on the track as rhe Dane limped back to the pits on a rim and a flailing tire carcass.